I painted up some Lead Adventure Miniatures Dwarves - from the Dwarven Gold Fever Kickstarter which had just arrived - for my entry for round eight of the Lead Adventure Forum’s Lead Painter’s League (could I cram anymore links into that sentence!?). Dwarven Rangers for Dragon Rampant (Scouts – 2 points). 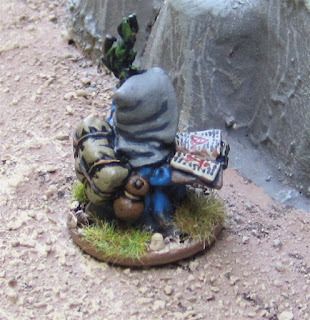 Four are the Lead Adventure Miniatures figures above. To round out the unit are figures from Reaper Miniatures and West Wind Productions. I tried to paint them with soiled and stained dresses and cloaks – like they’ve really been out in the bush crawling about in the muck. Scouts in Dragon Rampant aren’t going to win you any battles by destroying enemies – they are useless in hand-to-hand and can’t always be guaranteed to shoot (Shoot 7+) and don’t shoot as far as other missile units… but they do get around (Move 5+) and they’re hard to target with missiles – so I imagine they’d be good for scenarios which AREN’T just about killing the other guys – and would excel at denying the enemy control of areas of the table, running about gathering up gems, etc. This is Madgel. I’m not sure what I’ll be using her for – some sort of wizard or shameness. 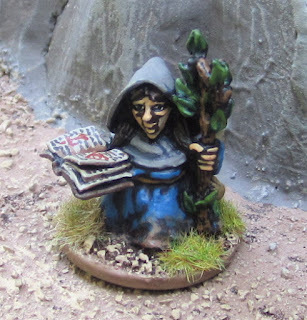 I have more dwarves coming up for Round Nine – but NOT Lead Adventure Dwarves – and they aren’t even for the same army as these! I never did post a pic of my My entry from Round seven. 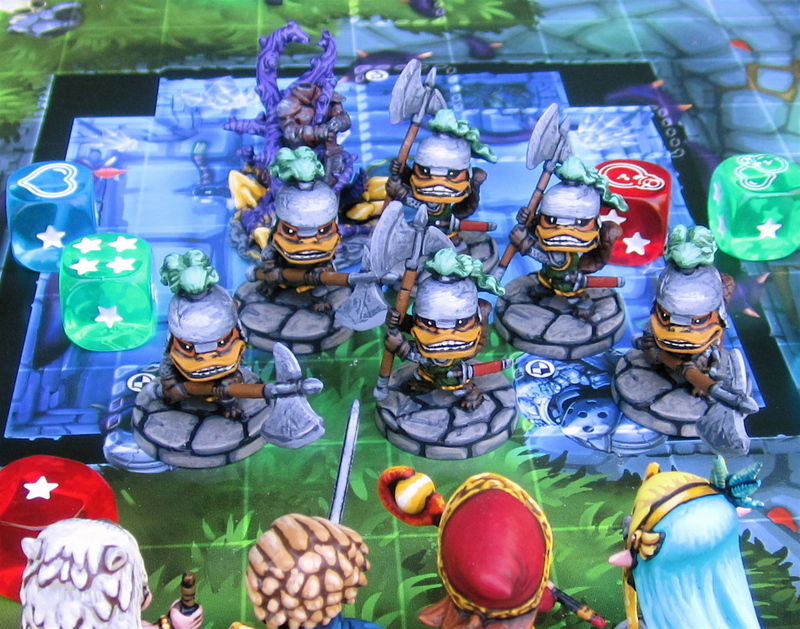 These are a few more miniatures I painted from The Girl’s Super Dungeon Explore: Forgotten King game. Billmen from Soda Pop Miniatures. I think these are totally fun to paint – though time consuming! I tried to paint them like they were illustrated on their cards – and without metallic paints to capture the cartoony style of the illustrations. Probably a round-up of the boardgames I’ve played over the last month, then maybe the Dwarves from Round Nine of the LPL. After that…? I’m not sure. This week I’m going to be painting up something for Round Ten and once that’s done I am determined to finish Rick’s Robot!? Only after that will I allow myself to start assembling more jet bikes! I like the female dwarves. There don't seem to be many of them around. Although I do have a few from various sources, they are vastly outnumbered by the male dwarf minis I own. The SDE billmen look great, too! I have to admit, the number of female Dwarves in the Kickstarter was one of the main reasons I backed it! Beautiful painted dwarves. I have some of these minis and theyre really great. Thanks Michał! the LAM figures certainly have a LOT Of character! Lovely looking dwarves and very nice cartoony bill men .